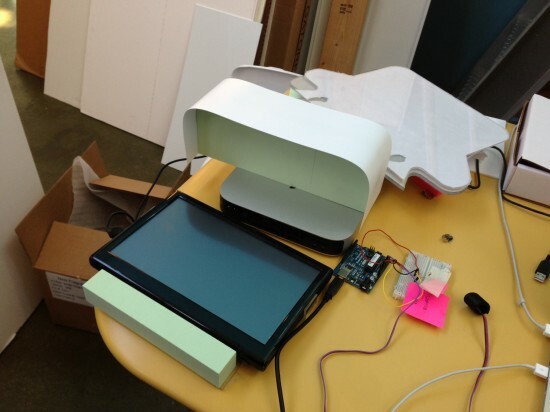 This week Smart Interaction Lab gave a talk called, “Making Meaningful Design with the Internet of Things” at the Webvisions conference in Portland (May 22-24 at the Oregon Convention Center). The conference was a fascinating look at the future of the web, exploring methods, strategies and business opportunities. Part information, part inspiration and part technique, we enjoyed sharing our point of view as well as meeting other designers, researchers and strategists from around the world. Other speakers included Leslie Bradshaw, Chief Operating Officer at Guide, a software company focused on turning online news, who spoke about how “The Future of the Web is Video”. Mark Frauenfelder, Editor-in-Chief of MAKE Magazine and former Editor-inChief of Wired Online, gave a talk on the future of making called, “Making Makers: New Tools and Ideas that are fueling a Movement”. Carolyn Chandler, User Experience Lead at Manifest Digital, spoke about “Using Game Mechanics to Motivate Your Audience” in a talk called, “Play to Change”. Something exciting has been happening to our everyday objects. Things that were once silent and static can now sing, glow, buzz and be tracked online. Some are constantly listening for sounds, sights and touches to translate into meaningful inputs. Others have the ability to learn, refining their behaviors over time. They can be connected to one another as well as the Internet. As people continue to interact with data in all aspects of life, they will expect their digital devices to deliver real-time, visualized, networked feedback. The WSJ envisions a roadmap where 50 billion devices could be connected to the Internet by 2020. Collectively, this “Internet of Things” will provide cloud-enabled experiences that can profoundly change many aspects of everyday life both in and out of the home. As designers, this presents a juicy opportunity to pioneer new territory in rich interaction, but it also can backfire, filling people’s lives with more frustrations over technology than ever before. In the talk, we shared stories from the front lines of designing interactive hardware/software products and ecosystems at Smart Design. We discussed challenges and highlighted opportunities where the combination of physical device and virtual data can provide a more meaningful experience than either alone. 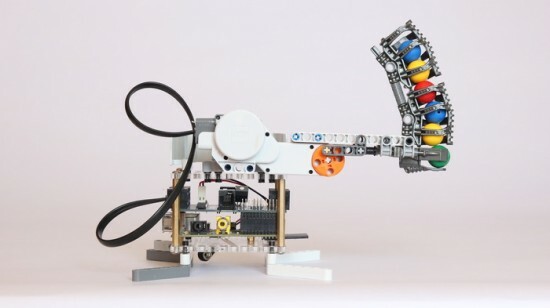 BrickPi + Lego = ROBOTS! We love this Kickstarter campaign for a product that lets anyone adapt a Raspberry Pi so that it can be used to control easy-to-assemble robots. 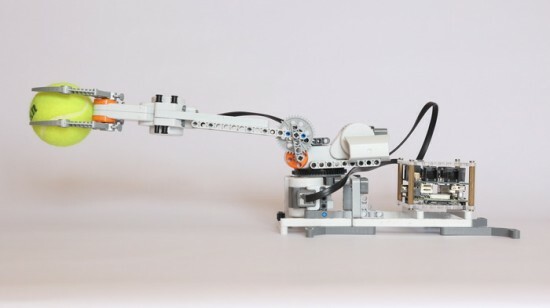 It features a sturdy case that Lego bricks snap onto, plus the BrickPi electronics board that lets Lego Mindstorms sensors, motors and other parts (up to 3 NXT motors and 4 sensors) plug directly into it. It also has a 9 volt battery source so that your robot can be tether-free; the battery powers the Pi as well as the Mindstorms parts. It wil be interesting to see how accessibile the coding for the board will be. The developers have examples in Python and are working on a polished library of code. 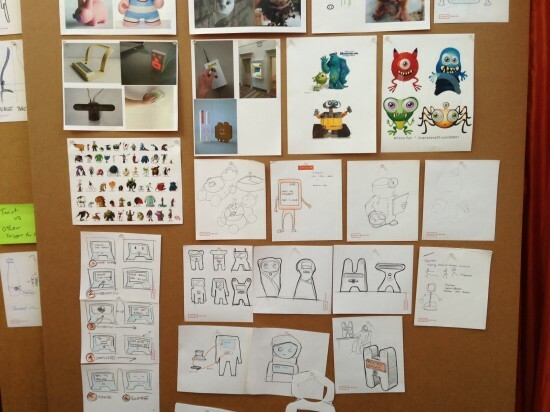 They also have ambitions to write a library for Scratch, the tile-based, visual programming language developed for children at the MIT Media Lab’s Lifelong Kindergarden group. For older adults and their families, the balance between maintaining independence and being cared for by others can be tricky to negotiate. It seems that a combination of sensor technology and web-enabled cameras could provide helpful information, but the potential for it to be invasive, insulting, and ultimately meaningless is pretty high. 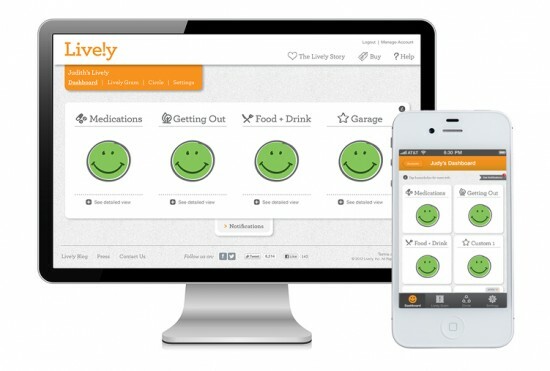 Lively is a product currently proposed on Kickstarter that negotiates these challenges well. Instead of an always-on vigilance system like a camera or a catastrophe-only solution like emergency alert buttons, Lively offers a number of “passive” sensors that keep track of subtle but meaningful movements throughout the day. 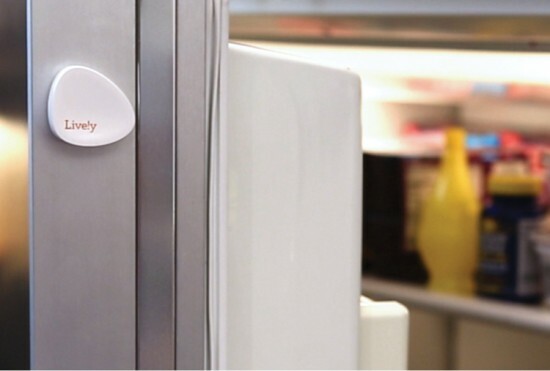 A unit on the refrigerator door, for example, gives an indication of eating habits, one on the medication dispenser shows when pills have been taken. Cameras do play a role in the system, but instead of being used to watch someone, photographs from other family members are compiled in a bi-monthly mailer to give the person being cared for a window into what everyone else is up to. The system works by offering a series of low-cost sensors that detect movement and communicate with a central hub inside the home. It doesn’t require wi-fi, as it has a built-in cellular connection, but does require an ongoing monthly service fee in addition to the initial hardware cost. Family members can log on to a website to view activity, and notifications are sent if a change in normal patterns is observed. While it’s being billed as something that gives the elderly person’s life more meaning, it seems like it’s more for the caretakers than for them. Nonetheless, it’s an interesting use of Internet of Things technologies, and harnesses design to place the tech into a friendly and meaningful context for people in their everyday lives. We’ve been enjoying getting our quantified self on in the Smart Interaction Lab over the last few weeks thanks to some great new sensors that work well with Arduino. 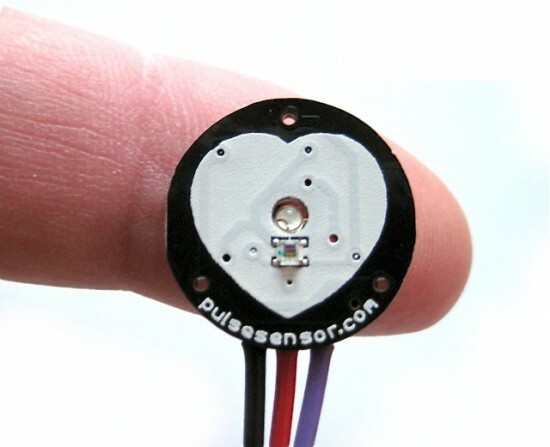 One of our favorites is the open-source Pulse Sensor product, which comes with a few handy ways to attach it to your body (ear clips, finger straps, etc.). A super helpful and well-organized website for the product provides source code for Arduino sketches that link up to Processing in order to give you visualizations that act as fascinating real-time windows into what’s happening with your heart rate and blood flow. We recently met with Joel Murphy, one of the product’s developers to chat about the science behind measuring stress and the link between stress and heart rate variation. In addition to learning more about Pulse Sensor, Joel also shared the exciting news that he’s part of a team that’s won a DARPA grant to develop a portable, low-cost EEG device and associated app. We’re looking forward to watching how the EEG project progresses, and in the meantime stay tuned for some experiments from the lab around Pulse Sensor. 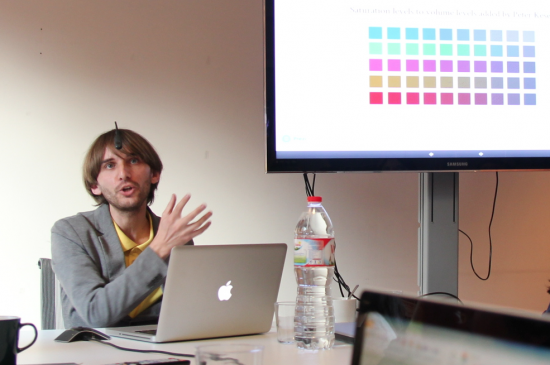 Last week as part of our Get Smart inspirational internal lecture series the Barcelona studio hosted a talk by Neil Harbisson, a Catalan-based artist, performer and self-proclaimed Cyborg, who regularly wears a distinctive antenna-like protrusion that sits above his head in order to amplify his perception of color. As he’s done recently in many talks, including his popular 2012 TED talk, he talked about his story of being born with achromatopsia, commonly known as color-blindness, or the inability to perceive color beyond black, white and shades of grey. After attending an inspirational lecture on cybernetics at Dartington College of Arts, Neil decided to work with a technologist on what he calls the eyeborg project. Through this project, he created a device with a head-mounted camera that will map color pixels to sound waves, so that the wearer can essentially “hear” colors. A technology developed by a student at the Universitat Politècnica de Catalunya allows people to have a chip implanted to go along with the device to actually perceive colors that the average human can’t normally see. In addition to telling the story of the development of the eyeborg, Neil shared some deeper stories about his pursuit of cyborgism. He described his commitment to wearing his prosthetic on a regular basis so that it essentially became a part of his body, and he shared stories of other people’s reactions, including some challenges around anti-cyborg intolerance. 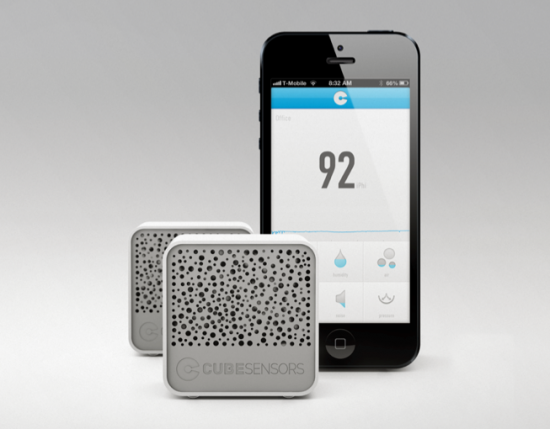 Cube Sensors are cordless, cloud-connected monitoring devices that can keep track of a collection of invisible measurements of the indoor environment such as temperature, humidity, noise, light, air quality and even barometric pressure. Physically, they are cool little enigmatic objects that sit quietly on the edge of a desk or coffee table, continuously taking in data and streaming it to the cloud. A smartphone app (iOS or Android) lets you check in to get a visualization of what’s happening and metrics attached to the different qualities of the environment. Alerts can be set up to offer recommendations such as when to ventilate a room or adjust the thermostat. The idea behind the cubes is to understand the indoors so that you can begin to make connections between how environmental factors and how people feel. The product website talks about understanding the “effects of temperature and air quality on your sleep” and “when and why people start feeling drowsy at a meeting”. We can think of a few factors that might contribute to that last one that the cubes wouldn’t catch, but we still think they are cool. In our brainstorms around ways that the Internet of things can improve our everyday lives, we’ve been particularly excited about the potential for the collection of crowdsourced data to empower communities. With the ability to monitor invisible quantities such as air quality or radiation levels, people can work together to create a “macro view” of what’s happening in their environments. Last year we wrote about Lapka Blocks, a kit of really pretty white and wooden blocks that can be combined with a smart phone app to give people a window into temperature, humidity, radiation, EMF, and even the amount of nitrates in their food. Another project we’ve got our eye on is the TrafficCOM, an open data platform for automobile and bicycle traffic counts. 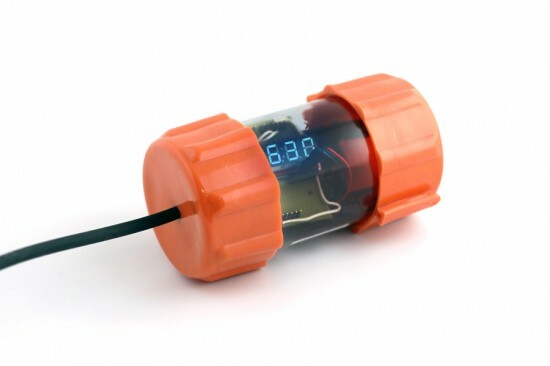 The device features a rugged sensor tube that can be laid out across a city street and then left in place to collect traffic data. Later, the device can be connected to a computer to view and share the data, giving people a window into transportation systems and urban dynamics that was previously only accessible through expensive products that were difficult to obtain. At this year’s South By Southwest festival, Google showed off a groovy prototype of a pair of web-enabled shoes with speakers embedded on the tongue. By tracking your movement and location as you wear them, the shoes can offer advice and coaching, and can broadcast your activity online. While it’s not clear the chatty sneakers are desirable to wear every day, we love that Google is putting experiments like these out there to ask questions and try out new experiences in the intersection of the physical and the digital. The shoes were commissioned by Google and created by NYC-based collective YesYesNo, founded by Smart Interaction Lab friend Zach Leiberman and Studio5050. A great review of the project can be seen on Art Copy & Code.